Coming to a basement near you! Mysterious Monsters is a humorous six-book early chapter book series full of mystery and adventure. When Marcus Mattigan, star of the popular show “Monstrous Lies with Marcus Mattigan” offers to let his kids, Maddie, Max, and Theo, travel around the country with him as he exposes frauds and fakes, the trio manages to find and capture the world’s most mysterious and elusive creatures – and then to hide them in their increasingly crowded basement. As you can imagine, with each book, the situation gets more and more hairy. 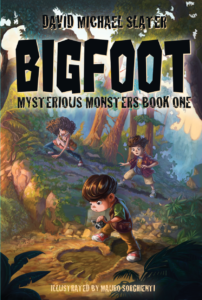 Mysterious Monsters, Book 1: Bigfoot! 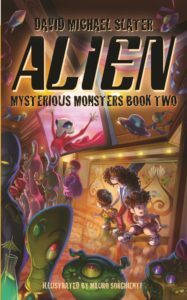 Mysterious Monsters, Book 2: Alien! 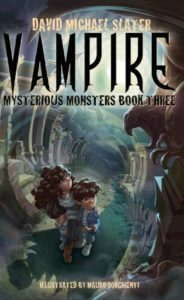 Mysterious Monsters, Book 3: Vampire! 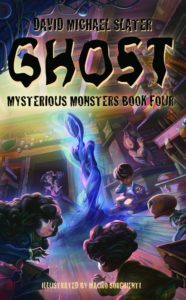 Mysterious Monsters, Book 4: Ghost! Mysterious Monsters, Book 5: Werewolf! Mysterious Monsters, Book 6: The Collector!